I'm on the hunt for some new jewelry storage ideas for my personal jewelry. I find my jewelry is treated less than idea, thrown into a box and that's just not very inspiring. First up are repurposed printer drawers from Etsy seller BlueBirdHeaven. I'm seriously coveting one of these! I could see a teal one in my studio, housing my earrings and bracelets. There are some on hinges that would rock as a show display. If you are feeling more DIY - show off that art bead jewelry in style - as framed art! This would look so lovely in my bedroom with my personal collection of jewelry treasures that I've collected over the years. You can find the directions at the Better Homes & Garden website. Here is another clever display idea spotted on the Brass Razoo Boutique website. I love this one for several reasons - 1. you can display a ton of jewelry on this. 2. It's all woodland-y awesome. 3. It's super green, you could recycle a found frame and go hunting for the twigs in your backyard. All of these finds were discovered on Pinterest. I am not responsible for the amount of time you will waste once you discover this site! Basically you create inspiration boards and 'pin' photos and links to your boards. 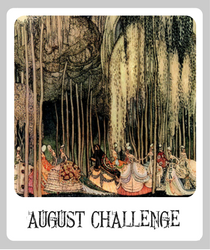 It's a great way to visually organize your inspiration and online finds. There is a button to add to your browser and 'pin' things when you find them online. It's also a great resource to see what's currently trending. You have to be invited to join the site, so if you have a friend that has talked about it, ask them to invite you! Be warned - this site is like crack for those addicted to design blogs! I have been wanting a framed jewellery storage solution, ever since I saw that last one on pinterest. I'm hoping once I move house I can put one together :) I hate having to untangle necklaces - how do they get in such knots?? Love all those ideas Heather! Especially the old window with twigs in the last photo. Great ideas! Thanks for sharing! Beautiful ideas, Heather. I've been thinking about this too lately, and am considering modifying one of the beadboxman's (Etsy) beautiful cigar boxes to hang on the wall for this purpose. And I'm totally kicking myself for unloading a printer's drawer I got from my grandmother a few years ago. Totally. I really like the idea of using the printer's tray to display earrings and bracelets. Thank you for sharing some of your finds on displays. You rock! This is an awesome idea! Love love love it! Very clever! I use old frames for my show displays but really should use one at home...duhh! I love the use of the twigs too! Thanks for sharing Heather. I am TOTALLY addicted to Pinterest! I didn't even think I would like it, but it is so fun. 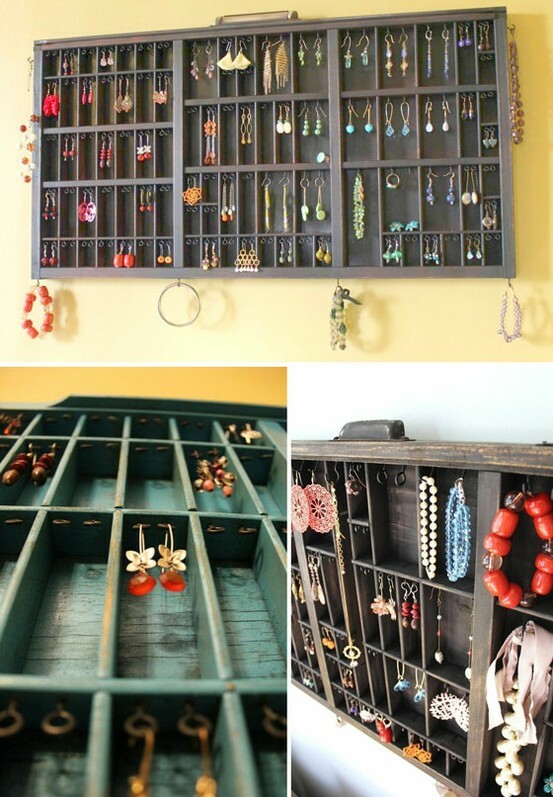 I will be pinning these jewelry storage ideas after I post this, in fact! I've been talking myself out of buying old printers drawers for years, fearing I'd never really use them. But you've helped me decide that the next time I see one, it's mine, mwahahahah! Agreed on the Pinterest fact - I just keep browsing... and browsing... and browsing... SO much amazingly cool stuff on there! I can't wait to get our house sorted and have my own space for beading so that I can start creating something like these! Fabulous post! I want all of these items. And I appreciate your warning about pinterest. I've been invited to join but am half afraid to get on the site. 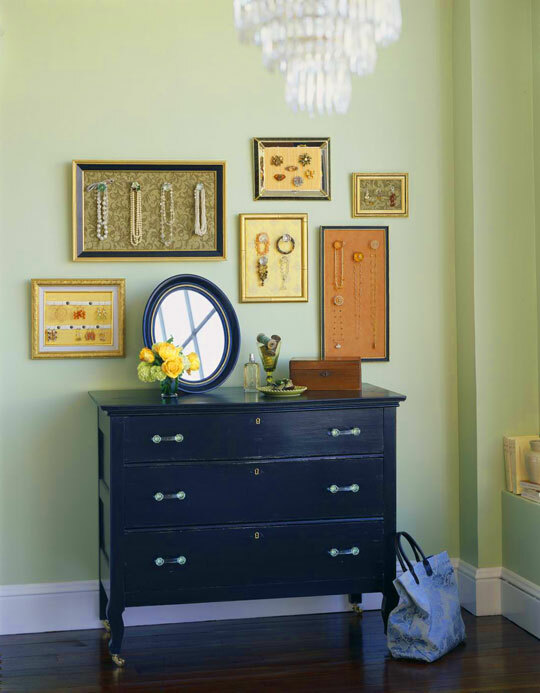 In the meantime, thanks for writing about these great jewelry storage items! Oh I LOVE those drawers! What a wonderful idea! These are fantastic Heather! I love the twiggy one - I'm going to have to make one for myself. Thanks for sharing! This post was a big "duh!" moment for me. A person who makes all of her own jewelry could be considered an artist. Shouldn't her art be displayed in a pleasing way? Just like a painter would hang canvases? So, why is all of my handmade jewelry in piles in drawers and containers? Crazy! Thanks for the poke to action. These display ideas are fab. Besides being a bead fanatic, I am an organizing fanatic. Great ideas, attractive and functional. I think it's a great idea to display your jewelry as if it's art. I like all these ideas, especially the printer's tray. When Keith Lo Bue makes a piece he also makes a stand to go with it so the piece can be displayed as art when not worn. That's an awesome idea. Great tips! I have some of my jewelry framed on the wall and it is nice to look at. Unfortunately, not enough wall space for me to hang all of it! absolutely loved this post! I was going through a storage dilemma myself! great ideas and particularily creative! 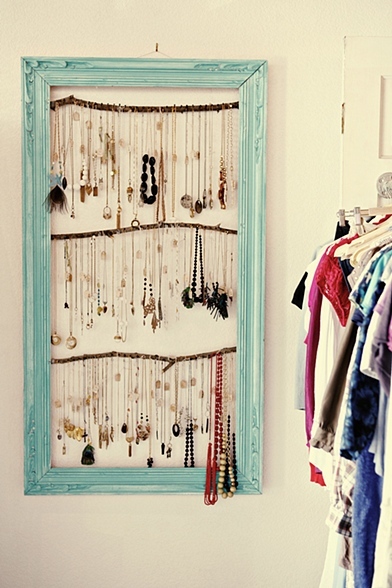 The jewelry cupboard idea is very interesting,the frame idea is also so nice. Exclusive post... Thanks for sharing .